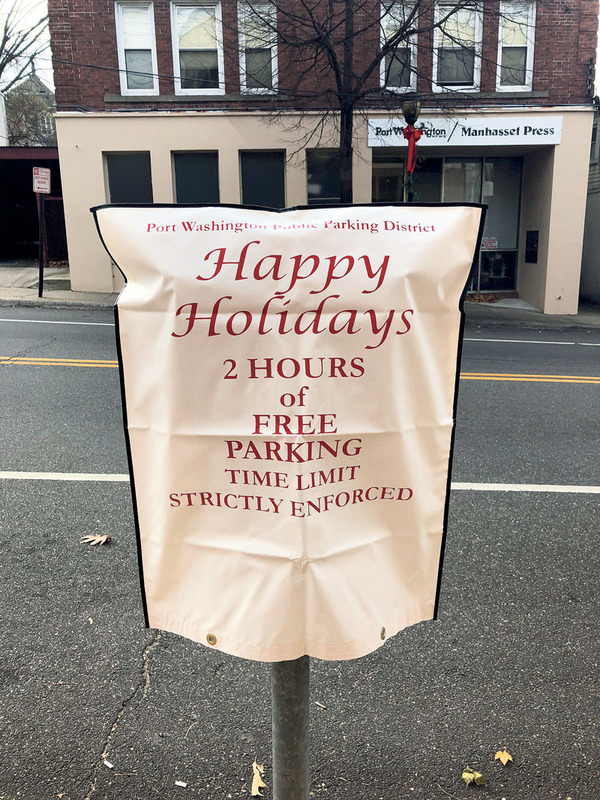 The Port Washington Chamber of Commerce has announced that the Port Washington parking district will suspend parking fees along Main Street and Port Washington Boulevard from Saturday, Dec. 9, through Boxing Day on Tuesday, Dec. 26. Attractive new holiday bags will be covering the meters throughout the holiday shopping season. Chamber co-president Mitch Schwartz thanked Town Councilwoman Dina DeGiorgio, Supervisor Judi Bosworth and the entire Town Board for allowing this holiday tradition to continue. There are so many other advantages of doing your holiday shopping right here in Port Washington, including receiving friendly, personal service and saving time, gas and frustration by not having to travel to malls and look for a parking space in the overcrowded mall parking lots. Of course, it is always safer to stay close to home when bad weather strikes. Most importantly, by shopping locally we are supporting the merchants that support our town all year. Remember, your local merchants care about you and support our community. Did you know that for every $100 spent in locally owned stores, $68 returns to the community through taxes, payroll, donations and other expenditures? If you spend that in a national chain, only $43 stays here. If you spend it online, nothing comes home. For a copy of the Port Washington Chamber of Commerce business directory, Try Port First, and suggestions on where to find that special gift locally, call the chamber office at 516-883-6566 or visit www.pwguide.com.